Egypt: More Protests Expected; Stock Market Plunges; Movement 'Growing' : The Two-Way While the feeling there is that the government isn't likely to fall, as Tunisia's did following similar protests, the demand for change spreading and Nobel Peace Prize winner Mohamed ElBaradei is expected to join the demonstrations. A demonstrator threw an object towards police during a protest Wednesday (Jan. 26, 2011) in Cairo. — From Cairo, NPR's Soraya Sarhaddi Nelson just told Morning Edition host Renee Montagne that "it's quiet for the moment, but it probably won't be for long." The pattern, Soraya said, is that "in the afternoon a lot of young people go into the streets ... [and] this movement seems to be growing." — The BBC reports that its correspondent in Cairo, Jon Leyne, "says that while the protesters are still only a minority of Egyptians, they show no sign of fading away and there is a chance that many more people will join once the working week finishes on Thursday. The government appears to have no answer to the anger and disappointment being expressed on the streets, our correspondent adds — its only response so far has been to crack down on demonstrators and increase security." — According to CNN, "Egyptian Nobel prize laureate and opposition leader Mohamed ElBaradei is Thursday returning to the country, which has been convulsed by unprecedented protests for the past two days, his brother [says]. ElBaradei will participate in protests himself on Friday, his brother Ali said." — Share prices are dropping hard on Egypt's stock exchange, which suspended trading for a short time earlier today. Reuters writes that the exchange's "benchmark index," the EGX30, is down close to 10 percent. — Secretary of State Hillary Rodham Clinton weighed in yesterday, saying that "we are particularly hopeful that the Egyptian government will take this opportunity to implement political, economic and social reforms that will answer the legitimate interests of the Egyptian people." 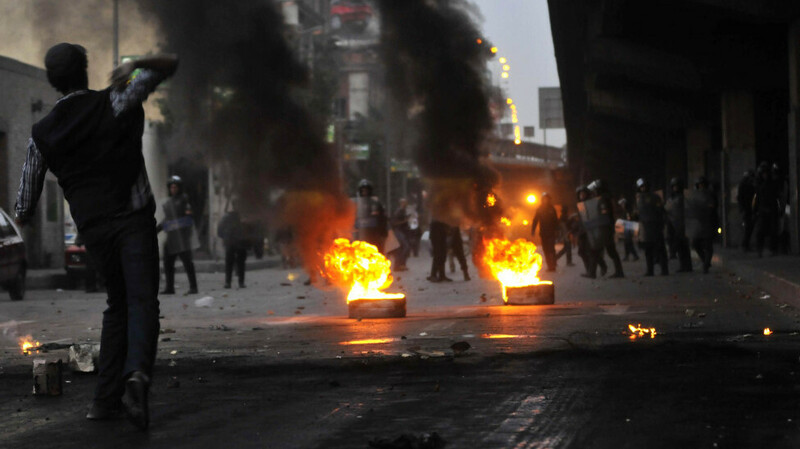 Will these protests spark a government downfall, as happened earlier this month in Tunisia? Soraya said this morning that the Egyptian government of Egyptian President Hosni Mubarak is "far stronger" than Tunisia's was, and "the feeling is that this is not going to be a sudden change. This is not likely to be another Tunisia where the first family flees." Meanwhile, the Associated Press writes that "tens of thousands of people are calling for the Yemeni president's ouster in protests across the capital inspired by the popular revolt in Tunisia."